After a day’s work of rolling and boiling lasagna noodles and making the two sauces for the dish, the house smelled of flavors we all had only previously smelled in restaurants. Surely the youngest daughter of this family didn’t just make lasagna from scratch! But I did, and I pulled the rectangular dish out of the oven too eagerly. Its slipped from my mittened hands and broke into pieces on the floor! Tears welled up in my eyes as I stared at the globs of noodles, sauce and cheese, and smelled the aromas wafting in my face. The shards of thick glass protruded from the heap of ruined lasagna. I ran away from the scene and locked myself in the bathroom for hours. Two sauces are created for this dish. 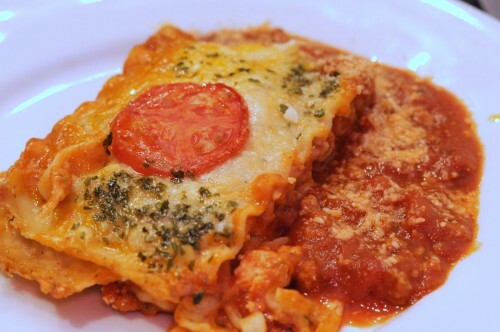 The tomato meat sauce and the bechamel sauce which serves as the “glue” that keeps the lasagna together. 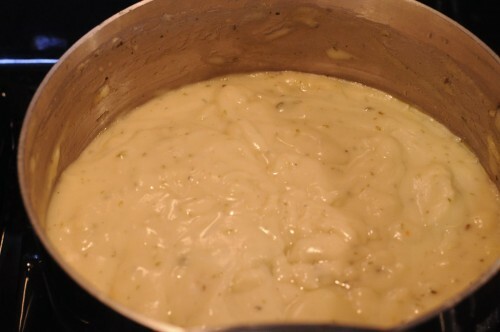 My bechamel sauce, originally made with grated cheese, now just relies on the grated cheese that is sprinkled on top of the dish before baking. Same diff. 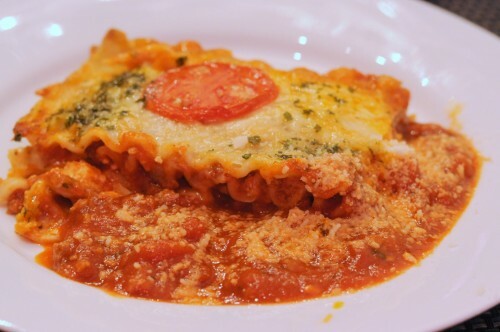 Layers of noodles, meat sauce and ricotta are added, and the bechamel sauce is used to line the edges of the dish to keep everything together. 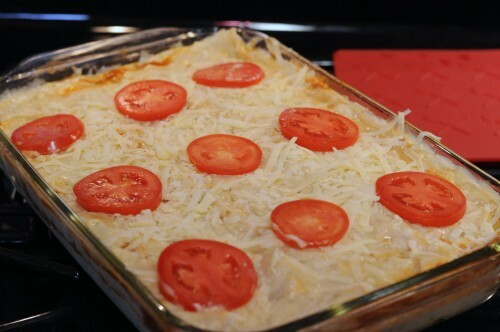 I like topping the lasagna with sliced tomatoes, cheese and some greens for color. In the absence of greens (usually fresh parsley leaves), I used dried parsley and ended up with the same colorful effect. Served with a side of extra meat sauce topped with grated parmigiano. From my childhood kitchen to yours: Mangia! In a casserole, sautee garlic and onion. Add ground beef and beef bouillon and cook until brown. Using fingers, crush canned tomatoes and add into the pot. Add pasta sauce and simmer for 45 minutes, stirring occasionally. Season with Italian seasoning, salt and pepper. Melt butter in microwave for 1 minute. In a pot over medium heat, add butter until hot, then mix in flour to make a pasty yellow mixture, creating a roux. Add milk and bouillon and mix well. Allow to simmer for about 15 minutes on low heat, mixing frequently to prevent bottom from burning. 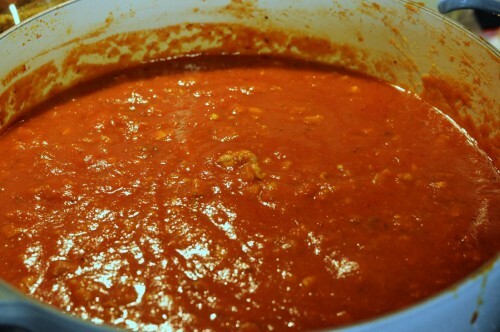 When sauce becomes thick (you may need to add more flour), season with Italian seasoning, salt and pepper to taste. Preheat oven to 375 F. Grease a 9X13 inch glass or porcelain baking dish. 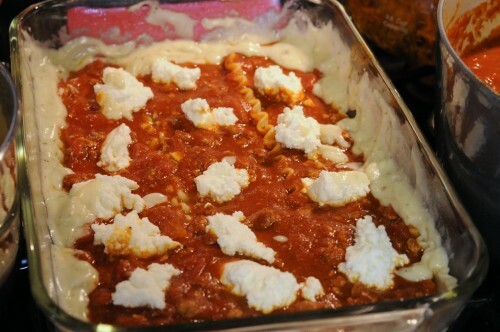 Arrange meat sauce, ricotta and noodles into layers like so: noodles, meat sauce, ricotta (spoon onto meat sauce), noodles, meat sauce, ricotta, etc., lining edges of dish for each layer with bechamel sauce. The top layer should be noodles, allowoing at least 3/4 inch from surface for bechamel sauce. Top dish with bechamel sauce, making sure edges are coated with bechamel sauce as this allows the dish to firm up later. 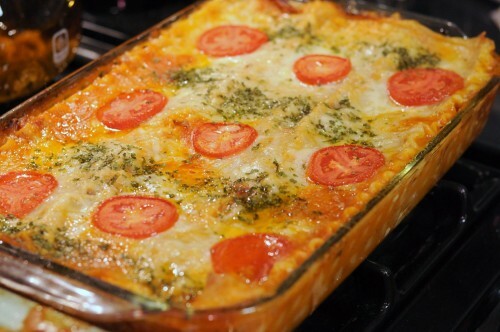 Decorate with sliced tomatoes and parsley and top with grated cheddar. Bake in oven for 45 minutes. Allow to cool for 30 minutes before serving to preserve its shape on a plate. Ahhh I wanna try this!! Thanks!! My friend wants to taste it. Looks great.